Fiorella WS is a brand of Focaccia Group, an Italian leader in the field of accessible vehicles, police cars and special vehicles conversion that has been active in the automotive sector for over 60 years. Focaccia Group's mission is to improve and make people's lives more accessible by creating products and cutting-edge components that overcome the car structural limits. From a coach builder to a specialised company, we have constantly searched for and developed new ideas and products featuring a unique, unmistakable style, always a step ahead in design, comfort and safety. We are suppliers of major institutional clients and work with leading car manufacturers for the development of specific conversion solutions, in compliance with the strictest design and manufacturing standards and European and National Standards for type-approval procedures. We operate at an international level, with two foreign branches in Switzerland and Brazil and an international distribution network extending in more than 40 countries. 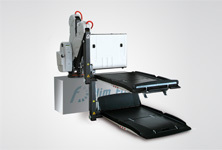 From Fiorella Slim Fit wheelchair lifts to F-Winch towing winches, Fiorella WS is the Focaccia Group brand featuring accessible-mobility components and accessories, products that stand out for their high degree of finishing and full compliance with safety standards. 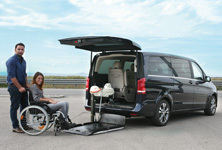 Licio Focaccia invented the first Fiorella lift in 1992 for a friend seated in a wheelchair: the lift had to be small enough to be installed on the side door of a VWT3, but solid enough to be loaded with up to 250 kg. In addition, in line with Licio's philosophy, the lift had to be nice looking in order to match vehicle interior design and satisfy customers' tastes. The result was the first Fiorella lift. Fiorella is an Italian female name which also means little flower, thereby referring to how a flower blooms and opens its petals to reveal itself in all its beauty. To pay homage to this revolutionary product, today the Focaccia Group has created a Fiorella-branded wide range of accessible-mobility components and accessories, with pioneering products in terms of Technology, Ergonomics and Safety. The ideal solution for people who shun compromise, Fiorella products are distributed in over 40 countries worldwide. In keeping with the Fiorella brand philosophy, everything designed to be used by People must be designed for People.